DigitalCorvettes.com wants you to win a VIP trip to SEMA and $10,000 in spending cash! In preparation to pull the trigger for a new set of wheels I bought one 18 x 10 American Racing Torq Thrust II VN215 with matte gray center to use as a test-fit wheel. I had a 265/40R18 tire mounted on it and it worked perfectly to verify the correct backspacing I needed for the new wheels. It has a +6mm offset (5.75" backspace) which is more backspacing than most people would be willing to run on a stock car. However, I was able to use a few other tools to confirm how much I needed to adjust to get the clearance I needed. To check the fronts I used a 1.25" wheel adapter to simulate a 4.5" backspace. I checked both sides and found that I had plenty of clearance at full lock. With the wheel turned all the way in I had 7/8" clearance to the stock sway bar and 1" clearance to the nose support bracket. With the wheel turned all the way out I had 3/4" clearance to the frame rail. So with an 18" wheel I could have gone for 5" backspacing and probably not had any contact, but the 4.5" BS gave me the right relationship to the fender that I wanted, so I left it at that. For the rear I used some 0.2" thick washers to approximate a 5.5" backspacing. With the spacers I found that I had 3/8" clearance to the leaf spring bolt and 1/4" clearance to the frame kick-up, but I did have a slight interference with the parking brake bracket on the trailing arms. With just a little grinding on that bracket I could have run 5.5" BS without any concern, but I opted to push the wheel a little further out to fill the wheelwell a little more and went with 5.375" BS. If anyone has interest in this wheel for test fitting purposes or for actual use on their car just let me know. It's basically pristine having only had a tire mounted and un-mounted one time. No road miles whatsoever. I'll cut you heck of a deal! Last edited by lsejlowe; 01-26-2019 at 07:13 AM. Optimists think the glass is half full. Pessimists think the glass is half empty. Engineers realize it's twice as big as it needs to be. I want to see too! sorry, you've gotta buy the wheel to see the pics! OK, I think I got it to work now. Seems to have been a share setting issue which would explain why I could see them on my end (logged into my google account) but no one else could see them. Had to add them to a shared album and re-link. Here's a pic of the end result with the new wheels. Please tell me you can see them now! Last edited by lsejlowe; 01-26-2019 at 07:18 AM. nice, what were the final specs on the wheels? Nice write up, anyway that 295 can be run on the front? I find a little piece of sanity through my vette project, other than that I rely on Jesus. Depend on with full trust or confidence. Offset trailing arms from van steel will make those wheels fit real nice in the back. Yes I ran a 17X 10 with a 315 on my 81. Flush with the fender but had to go with a custom sway bar. Great information, Thanks for posting. In order to be able to post messages on the Corvette Forum : DigitalCorvettes.com Corvette Forums forums, you must first register. Please enter your desired user name (12 CHARACTERS MAXIMUM), your email address and other required details in the form below. City / State / Country? 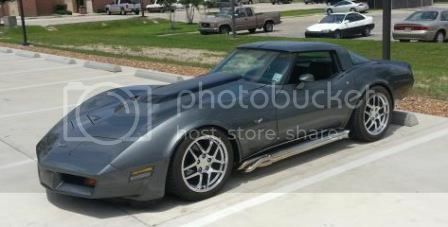 What kind of Corvette(s) do you own? This field is not required.